The urban system in most countries is influenced by market forces. Cities that produce goods and services that are in demand and attract people to live in them will have faster growth than those that do not. Government generally has little direct influence on the development of the urban system. Since World War II, especially in the past two decades, urban systems in the Western countries have been influenced by the regional shift in production as a result of the restructuring of the economy. In the past, before the adoption of the open policy in 1978, the Chinese government played an important role in urban system development. Politics and public policy were the two most important factors shaping urban development in China (Lo, 1987). They exerted a strong influence over the growth of the urban population (Xu, 1984a), urban system development (Xu, 1984b), city system development (Yeh and Xu, 1990a,b), and the provincial distribution of the urban population (Yeh and Xu, 1984). However, the importance of government's role in shaping urban development has been reduced since the adoption of economic reforms and the open policy in 1978. In the past, the ability of the government to exert a strong influence on urban development was mainly through population control and resource allocation. A household registration (hukou) system was established in 1954 to stop unauthorized migration from the countryside to the cities and uncontrolled growth of large cities. It divided the population into agricultural (nongye renkou) and nonagricultural (fei nongye renkou), which was used in conjunction with the food rationing system to regulate the monthly quotas of foodstuffs, consumables, and consumer durables (Kirkby, 1985). The household registration system required all neighbourhood residents to register with their local police station. In collaboration with lower-level civilian officials, police ran late-night household registration checks to ensure that people did not move into the neighbourhood without proper registration. The household system was effective in controlling the population in cities because of the widespread rationing of foods and state control of jobs and houses through the late 1970s. Without proper neighbourhood registration, one had no access to many highly subsidized and otherwise unavailable consumer necessities such as grain, cloth, oil, pork, bean curd, and soap. The predominantly publicly owned housing was not accessible and it was the same for the over 90 per cent of all state- and collective-controlled jobs (Whyte and Parish, 1984). The household system was further tightened by a migration law in 1958 that limited the entry of peasants into cities, except those who had obtained work permits from the labour bureau. The household registration system was effective during the Cultural Revolution (1966-1976) in sending youths to the countryside. There was an absolute decrease in the population of the large cities, with a net decrease in the total population of the city system (Yeh and Xu, 1990a,b). Some of the extra-large and large cities were sufficiently depopulated to become large and medium-sized cities. Resource allocation also played an important role in shaping the social space of cities (Xu, Hu, and Yeh, 1989). Because of the housing allocation system, residential location is mainly governed by one's employment and the location of housing by production/working units in which one is employed. 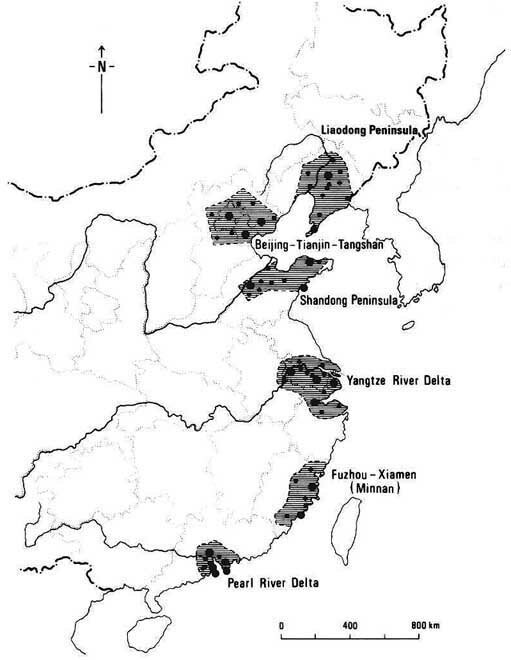 Clusters of social areas were found in Chinese cities and their characteristics were determined by the location of the production units and the population composition and characteristics of those employed by them. Before the open policy in 1978, with population control and resource allocation, the Chinese government was remarkably successful in shaping the urban system according to its public policy and ideology. The growth of large cities was successfully curtailed, small towns were developing rapidly, and cities and city population were successfully shifted from the coast to interior and border locations. This was the result of a centrally controlled government. Many of the means needed to achieve these results are not available in other countries. Without tremendous central control over human mobility and economic resources, it would not be possible to control the population and to allocate resources to desired places successfully. It was the control over jobs, housing, and daily necessities that made it possible to exclude people from cities. It was the centralized ownership of industry that made it possible to shift resources from larger, coastal cities to interior ones. All this has changed since 1978. The urban system of China consists of cities (chengshi) and towns (zhen). The designation of cities and towns is governed by the Ministry of Civil Affairs. The criteria of designation change in different time-periods, reflecting the prevailing urbanization policy, economic development, and political ideologies. These criteria have considerable impact on the number and population of cities and towns in the urban system of China. Because of better provision of public facilities and more fiscal autonomy, many towns would like to be upgraded into cities. Immediately after 1949, there were no formal criteria for establishing cities. As a result, many cities were established. To control the rapid increase in the number of cities, the State Council passed the "Decision on the Establishment of City and Town Government" in June 1955 (Ministry of Civil Affairs, 1986:461-464). Population size and economic and defence significance became the main criteria for granting city status. Urban centres with a population of more than 100,000 could be granted city status, whereas those of less than 100,000 could be granted city status only if they were an important industrial or mining base, the home of provincial institutes, a large market town, or an important urban centre on the border. Cities established before 1955 that did not meet these criteria were to be downgraded from cities to towns. These criteria were used until 1963, when the State Council decided that there were too many cities in China. Some urban centres had included considerable rural areas within their boundaries in order to boost their population to the levels necessary to obtain city status. In some cases, the mainly rural population of a city's suburban districts was much larger than the population in its urban district. To correct the abuse of the population criterion, the State Council announced the "Instruction on the Adjustment of the Establishment of City and Town Government and the Reduction of the Areas of City Suburban Districts" in December 1963 (Ministry of Civil Affairs, 1986:464-468). The proportion of agricultural population in a city was not to exceed 20 per cent. If it was over 20 per cent, it had to be reduced. If it could not be reduced, the city government had to obtain approval from the State Council via its respective provincial or autonomous region government. After reducing the areas of the suburban districts, an urban centre would lose its city status if its population could not meet the 1955 population criterion of 100,000. An urban centre losing its city status would revert to its original status as a county or town. These criteria for granting city status continued until 1978. They were relaxed after 1978 to meet the demand for rapid economic development of the open policy and the concomitant changes in the characteristics of cities. These stringent regulations did not begin to be relaxed until the 1980s. In 1983, a new set of criteria for granting city status were used internally by the Ministry of Civil Affairs. These criteria were finally formally adopted in April 1986 in the "Notice on the Report of the Adjustment of the Criteria of Establishing City Government and the Conditions for City Governing County" (Ministry of Civil Affairs, 1986:470-472). Compared with the previous criteria, more emphasis was given to the employment structure and economic development of the urban centre rather than to population size. An urban centre could be granted city status if it had a non-agricultural population of over 60,000 with an annual GNP of RMB200 million and had become an important economic centre. There are a number of special conditions under which more liberal criteria can apply for designation as a city compared with earlier years. There are two main types of towns: designated towns (jianzhizhen) and market towns (jinzhen or xiangzhen). The population in the designated towns is reported in the statistical yearbooks of China as part of the urban population but that in market towns is not reported. In 1955, a human settlement could be granted town status by the provincial government if it had a permanent resident population of more than 2,000, of which 50 per cent or more were non-agricultural. In 1964, these figures were raised to 3,000 or more with over 70 per cent non-agricultural population. A human settlement between 2,500 and 3,000 could also be granted town status if its non-agricultural population was over 85 per cent. Many previous towns had lost their town status because of the tightening of the criteria for town designation. The main reason for tightening the designation of cities and towns was to reduce the size of the non-agricultural population to whom the state had to supply grain. In 1983, communes were abolished and townships were revived. There was a sharp increase in the number of towns because of the relaxation of the criteria for designating towns. A township seat with a total population of less than 20,000 may be granted town status if its non-agricultural population exceeds 2,000. For a township of more than 20,000, the township seat may become a designated town if 10 per cent or more of its total population is non-agricultural. Other human settlements that can become designated towns include the seat of county government, small industrial and mining districts, ports, and tourist places in minority regions or in sparsely populated, mountainous, and remote border regions. There has been a marked increase in the number of towns because of the changes in the criteria for the designation of towns. The number of towns jumped from 2,781 in 1983 to 6,211 in 1984. The definition of urban population has been very problematic in China, particularly in 1983 when many counties were abolished and turned into cities and in 1984 when many townships were abolished and turned into towns (Chan and Xu, 1985; Ma and Cui, 1987). The urban population reported in the statistical yearbooks of China refers to the total agricultural and non-agricultural populations within the administrative boundaries of the designated cities and towns, excluding counties under the jurisdiction of cities. This overinflated the urban population of China. If this figure is used for estimating the urbanization level in China, the urbanization level increases from 17.9 per cent in 1978 to an astonishing 51.7 per cent in 1989. Over 63 per cent of the urban population in 1989 were not involved in urban activities. The non-agricultural-based urban population in cities proper (inner cities) and towns is a better estimator of the urbanization level in China because it is less affected by changes in the boundaries of cities and towns and is more involved in urban activities (Ma and Cui, 1987). Based on official statistics, there has been a marked increase in the urbanization level of China since 1978. However, the major increase in the urbanization level is due not to the increase in rural-urban migration but mainly to the increase in the designation of human settlements as cities and towns and the enlargement of the boundaries of cities and towns. In 1979, the "city leading county" (shidaixian) system was implemented. As a result, many counties were abolished and turned into cities without any change in boundary and name while some others were merged into cities. There was a relaxation of the criteria for establishing cities in 1983 and many counties and towns have been upgraded to cities (Yeh and Xu, 1990b). The number of cities increased from 194 in 1978 to 450 in 1989. In 1984, with the changes in the criteria for designating towns, where a township seat was granted town status if its non-agricultural population exceeded 2,000, many townships (xiang) became towns. The number of towns increased dramatically from 2,781 in 1983 to 6,211 in 1984, adding 73.2 million to the urban population. Of the 73.2 million, 89.8 per cent were agricultural. The regional distribution of the urbanization level is still similar to that prior to the adoption of economic reforms and the open policy. Most of the relatively highly urbanized provinces are located in the western and northern parts of China, such as Xinjiang, Xizang, Inner Mongolia, Liaoning, Jilin, and Heilongjiang (fig. 7.5). This is because the provincial variation in the urbanization level in China is positively related to per capita economic output, industrialization level, and land area, and negatively related to population density (Yeh and Xu, 1984). Most of the coastal provinces have a high population density and a small land area and therefore do not have a high urbanization level. The open policy has had some effects on the increase in the urbanization level of the coastal provinces. In 1985-1990, provinces with a big increase in their urbanization level were mainly found along the coast or near to the coast (e.g. Guangdong, Anhui, Henan, and Shangdong) (fig. 7.6). If this trend continues, it will change the pattern of regional distribution of the urbanization level in China, with the coastal provinces becoming increasingly urbanized. The most spectacular impact of the post-1978 era was the increase in the number of cities. There was a more relaxed attitude towards the establishment of cities. The granting of city status was also used as a mechanism to help local authorities to attract foreign investment. As a result, the total number of cities jumped rapidly from 194 in 1978 to 467 in 1990 and the city population (non-agricultural population in cities proper) soared from 84.1 million in 1978 to 150.38 million in 1990. A relatively large number of small and medium-sized cities were added to the city system.2 As a result, there has been a decline in the proportion of large cities and an increase in the proportion of small cities (fig. 7.7) (Yeh and Xu, 1990a). The open policy has reversed the previously much emphasized city and economic development in the Western and Central regions. As a result, the trend of decentralization to Western and Central provinces was reversed after 1978, with new cities and population added to the Eastern Coastal region. Unlike Western countries, where cities play an important role in the economy, the contribution of cities to the economy of China is less significant because of its large rural population. In 1990, they contributed only 35.0 per cent of total GNP. However, cities still play an important role as manufacturing centres and major foci for attracting foreign direct investment. They contribute to over 80 per cent of the total light and heavy industrial output and 69.9 per cent of total foreign direct investment. They also contain a large majority of state and collective enterprise workers and a high proportion of workers (85.2 per cent) in enterprises outside the state and collective enterprise system. The new rural policies, which introduced the "responsibility system," have increased productivity by giving incentives to those who work hard. Farmers can sell their surplus products in the free market after fulfilling the contracted quota. Along with the increase in productivity of farming there has been tremendous growth in rural commercial and manufacturing activities and the revival of market towns. Rural industries are a significant source of income and employment opportunities for peasants (Chang and Kwok, 1990), employing a growing proportion of surplus rural labour. They produce goods and services for the rural economy and have a steady demand for raw materials. Rural savings are reinvested in rural enterprises. With free markets and rural industrialization, there has been a rapid growth of small towns in China. Rural urbanization was praised by Fei (1984) as the solution to China's rural surplus labour problem by allowing people to leave their farmland without leaving their villages (litu bulixiang). Rural urbanization is phenomenal in China. There has been a rapid increase in the number of towns from 2,176 in 1978 to 11,481 in 1988. In some growing regions, such as the Pearl River Delta, small towns are growing faster than the cities, reversing the urbanization trend of most developing countries where cities are growing faster than towns (Xu and Li, 1990). 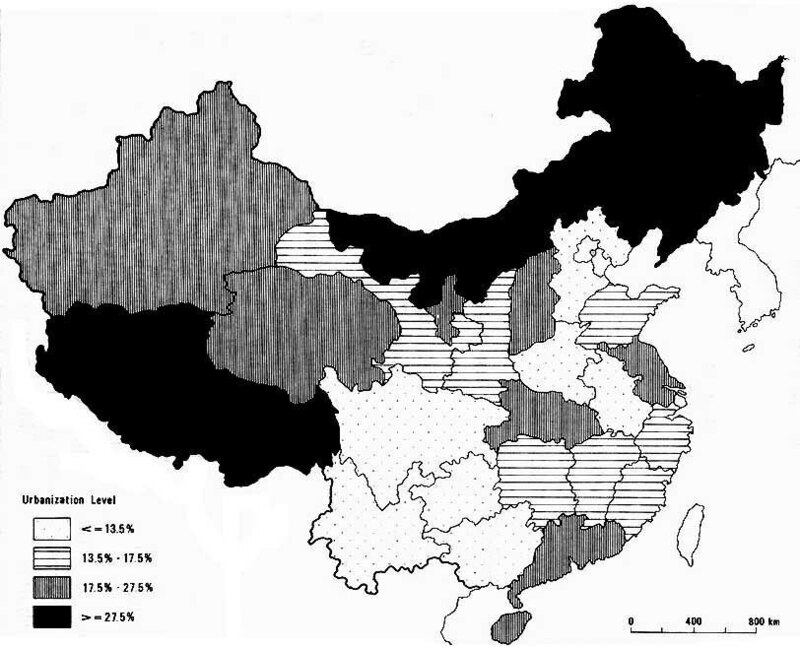 Rural urbanization is highly concentrated in the Eastern Coastal region (Zhou, 1991). For some more prosperous areas, such as the Pearl River Delta and the Yangtze River Delta, economic reforms and the open policy have reinforced the development of previously established urban clusters. Some new urban clusters are emerging (Zhou, 1991; Yao et al., 1992) (fig. 7.8). These areas have high levels of urbanization and involve rural labour in non-agricultural activities. (1) Liaodong Peninsula (Shenyang-Dalian), centring on Shenyang and Anshan. The Shenyang-Dalian region spreads from Shenyang in the north to Dalian in the south. Shenyang is the major industrial town of China and Dalian is the major port. Cities in the region include Anshan, Fushun, Benxi, and Liaoyang. They are connected by railway and expressway and are dominated by heavy industry. (2) Beijing-Tianjin-Tangshan, focusing on Beijing. Beijing and Tianjin are the dominant cities of this cluster. Other important cities of the region include Tanggu and Tangshan. Beijing, Tianjin, and Tangshan are linked by the Beijing-Shenyang railway. (3) Yangtze River Delta (Nanjing-Shanghai-Hangzhou), centring on Shanghai. Shanghai is the dominant city of this cluster with Nanjing and Hangzhou as supporting cities. Other cities within the cluster include Wuzi, Suzhou, Changzhou, Ningbo, and Nantong. The Nanjing-Shanghai-Hangzhou-Ningbo railway, the Grand Canal, and the Yangtze River are the major transportation networks linking these cities. With the development of the Pudong new district in Shanghai, there will be much development in this urban cluster in the near future. (4) Pearl River Delta, centring on Hong Kong and Guangzhou. Guangzhou and Hong Kong are the main cities in this region. The Guangzhou-Kowloon railway, the Pearl River channel, and the Shenzhen-Guangzhou expressway that is under construction are the major transportation links. Because of its proximity to Hong Kong, the Pearl River Delta region has become the region where both the market and openness to the outside world are the most advanced in China. It has the two fastest-growing SEZs in China. Its economic development has been regarded as one step ahead of the rest of China (Vogel, 1989). Investment from Hong Kong has strongly stimulated manufacturing, tourism, and retailing in the region. There are many temporary workers from other parts of Guangdong and from other provinces such as Sichuan, Hunan, and Guangxi. These clusters are situated either in deltas or on plains with abundant natural resources and a long history of development. They have a high density of population and abundant agricultural or industrial production. Clusters (2)-(4) are China's important agricultural and commercial centres. The capital region and south Liaoning clusters are China's major producing areas of coal and iron, and also China's metal, machinery, petrochemical and industrial centres. These urban clusters are booming in the economic reform and open policy period because they are located along the coast and are more accessible to the world. Apart from the further development of existing cities, new cities are beginning to emerge within these clusters; for example, Dongguan, Shenzhen, and Zhuhai in the Pearl River Delta, and Changzhou in the Yangtze River Delta. Economic reforms and the open policy have also led to the emergence of new urban clusters of cities. Two clusters have great potential for further development. They are Shangdong Peninsula, centring on Qingdao, and the Fuzhou-Xiamen (Minnan) area, centring on Xiamen and Fuzhou. A foreign-oriented economy and local manufacturing industries are developing rapidly in these clusters. (5) Shandong Peninsula - concentrating on Jinan and Qingdao, with Yantai as the major port of the region. The Jiao-Ji (Shantung) and Lan-Yan railways are the major transport links. Because of its proximity to Korea and Japan and abundant agricultural, forest, and fishery products, it has high potential for being developed. (6) Fuzhou-Xiamen (Minnan). Fuzhou and Xiamen are not strong enough to function as major growth poles. Railway links are still relatively poor but the recently constructed expressway has improved communications within this urban cluster. It has great potential for development if trade between Taiwan and Fujian is allowed. Before economic reform was adopted, industry was quite backward. After the designation of Xiamen as an SEZ and with Quanzhou as a coastal open city, industries with foreign investments and local manufacturing industries are developing very rapidly. The open policy has changed the economic structure of China's cities. More people are working in the tertiary sector and in non-state-owned enterprises. With rising living standards and a need for a better network for selling the products of reformed enterprises, the tertiary sector is growing rapidly. In the 74 main cities surveyed by the State Statistical Bureau, the average percentage of the tertiary sector in the cities' GNP increased from 19.1 per cent in 1978 to 32.6 per cent in 1988. Employment in the tertiary sector increased from 24.2 per cent to 33.9 per cent. Changes in the economic structure of the cities are faster in the SEZs where free markets work better than in other cities. In 1989, 45.9 per cent of the labour force was employed in the tertiary sector in the four SEZs as compared with 31.6 per cent in the 74 economic reform cities and 36.7 per cent in the coastal open cities (table 7.4). Source: China Urban Statistical Yearbook, 1990, p. 63. Source: China Urban Statistical Yearbook, 1990, pp. 593, 603. Despite the existence of non-state-owned enterprises, the majority of people in the cities still work in state-owned enterprises. There has been only a slight increase in the percentage of people in other forms of employment, such as individual enterprises and enterprises with foreign investment. There is wide variation among cities with different degrees of economic reform. There is a much higher percentage of people working in non-state-owned enterprises, particularly individual enterprises and enterprises with foreign investment, in the SEZs than in other types of cities (table 7.5). Some 29.8 per cent of the workers in the SEZs are employed by non-state and non-collective-owned industrial enterprises and 18.9 per cent by non-industrial establishments. In contrast, only around 2.9 per cent and 2.0 per cent, respectively, of workers in the coastal open cities are so employed, which is higher than in other cities under reform. This is mainly the result of the degree of economic reform and the utilization of foreign investment in these cities, with greater economic reform and foreign investment in the SEZs. 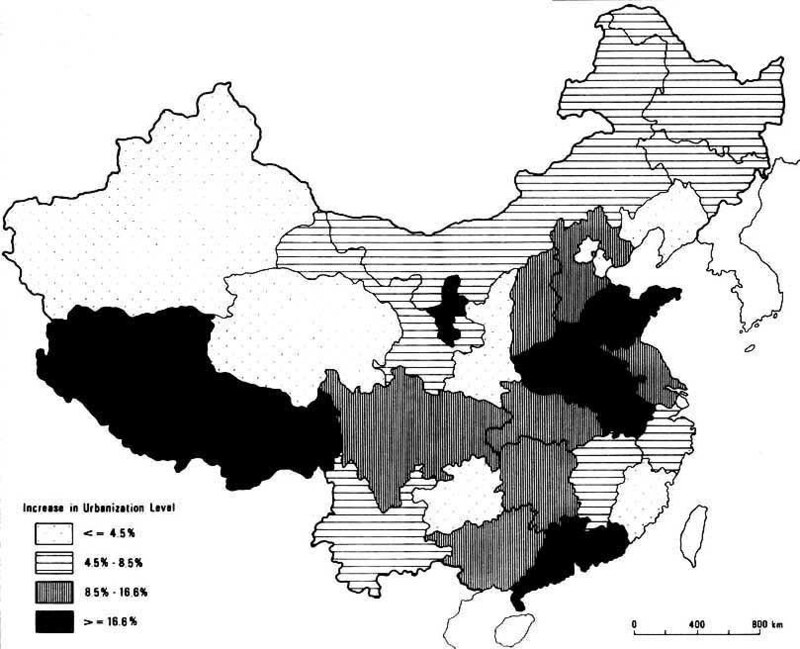 Source: China Urban Statistical Yearbook, 1989 and 1991.